One of the reasons I started this project was to clear up misconceptions about the appearance of common sailors in the period. This post will be something of a lark, a break from my examinations of period illustrations, prints, and paintings to critique depictions of sailors in my period in mass media. This blog is certainly not Frock Flicks (which, by the by, I highly recommend), but I think this should be a fun distraction. To keep from going too far afield, I'm focusing just on the American Revolution today. Too often Jack Tar is depicted as a mid-nineteenth century sailor would have dressed. This is thanks in large part to Jack Coggins' 1969 book Ships and Seamen of the American Revolution and John Mollo's otherwise pretty good 1975 Uniforms of the American Revolution in Color, a portion of which I addressed in the past. The idea that sailors in the past wore sennit hats with a broad black ribbon around the crown and bound in white tape, or perhaps coated in tar or pitch, is emphasized with frustrating regularity in mass media. For example, this chap in HBO's John Adams, Episode 2: "Independence," around one hour and 25 minutes in. Leaving aside that his trousers look to be cotton, the folded back lapels neatly buttoned, and the incredibly loose neckcloth that dangles over his chest, the hat gets my goat. I've seen nothing in any of the images I've examined to support such headware. 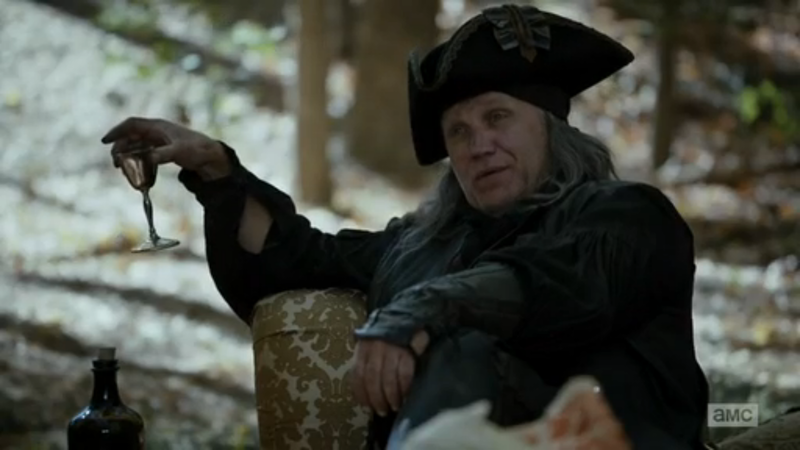 The show does redeem itself somewhat in the third episode, "Don't Tread on Me," about twelve and a half minutes in. These outfits are more practical. The overcoats are fine, especially given the image of the "Sailor Sentinel" painted by Gabriel Bray in 1774. The biggest issue is what's missing. Nobody is wearing trousers or petticoat trousers. Only one sailor has a blue jacket that we can see. 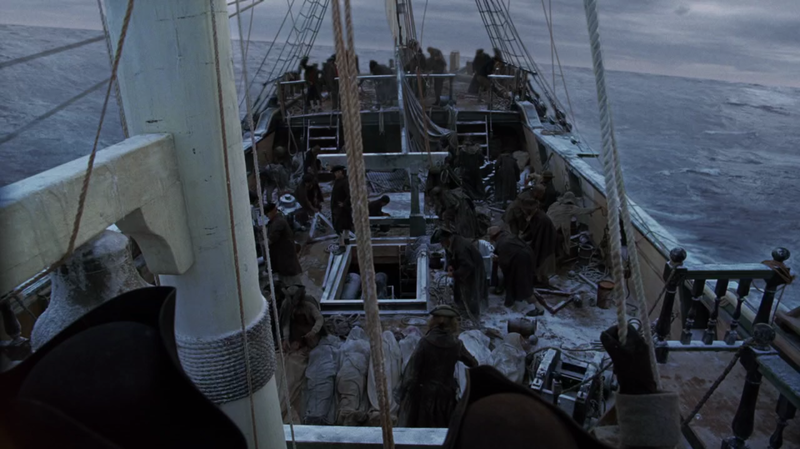 Only one or two of the tars have round hats, and every single cocked hat (of which there are three or four shades, as opposed to the overwhelmingly dominant black) has its point forward. The point is, almost none of these men look like sailors. Seconds later, we get a view of the foc'sle head. This shot is improved insofar as one man is wearing a blue jacket, and another (if you look closely) is wearing a pair of trousers. It is unfortunate that the otherwise pretty well dressed Continental Navy officer is wearing his overcoat hanging off the shoulder like the heroine on the cover of a cheap paperback romance. In the image below our sailors wear jackets that still have those fairly uncommon buttoned back lapels, and one of those neckcloths is as short as a bowtie, but at least AMC's Turn manages to get a bit closer with a woolen cap, linen work cap, and neckcloths that are actually fitted around the neck. These guys actually look like sailors! This screenshot is from season one, episode three: "Of Cabbages and Kings," about 42 minutes in. Before we give Turn too much credit, take a look at this abomination from season two, episode four: "Men of Blood." 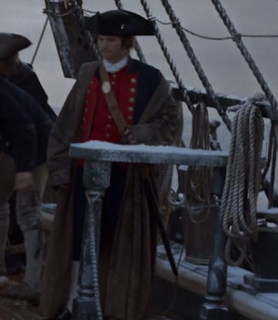 The filmmakers have a whole "privateer" crew that are dressed like they came out of Pirates of the Caribbean. J.L. 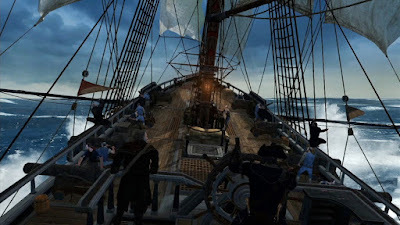 Bell, of the Boston 1775 blog, covered this silliness over at Den of Geek: privateers and pirates are not simply a 1:1 comparison. At that, pirates of the late eighteenth century didn't dress like they were going to the Renaissance Faire; they dressed like sailors because they were damned sailors. This "privateer" captain wears a black hat with the brim bound in a fancy tape and a nice cockade, which about the most accurate thing we see. Otherwise he has a black shirt (has anybody actually seen a black shirt on a mariner? ), a strange black bandage or cap around his head, long and untamed hair and drapes down over his shoulders, and for some damned reason, a leather brace. Is he a right hand dominant archer? What the hell purpose does that serve? In fairness, vambraces do make an appearance in a 1774 Gabriel Bray illustration of a sailor and marine (or possibly naval officer) ashore, but they look nothing like Captain Arr's brace here. That thin leather would do nothing against a cutlass blow. TV shows aren't the only culprits for bad depictions of sailors. This screenshot comes to us from the video game Assassin's Creed 3. Just like John Adams, we run into the problem of sailors looking nothing like sailors. Denim waistcoats abound, which make no goddamn sense. Were these men pressed from a 1980's biker gang? Some sailors wear red sashes, something that is pretty much absent on British and American sailors, though more common among French. Many of these supposed tars wear gaiters and tall boots, which is unheard of. Not a single one of them wears a hat, save for the captain. The only nod to these men being sailors is that one of them wears a shirt with broad blue and white stripes running horizontally. This might make sense if they were nineteenth century Russians. Overall, a pretty abysmal show on three of the most successful forms of mass media to depict sailors in this era. Can you think of a production that put up a better fight? How about movies, video games, comics, or other visual media that did just as poorly or worse? Let me know in the comments! I study Anglo-American sailor's clothing for period prior to your site's period of interest, 1680-1740. I did my thesis on the subject as well. For media depictions that are better, the made for TV "Longitude" from 2000 may be of interest. 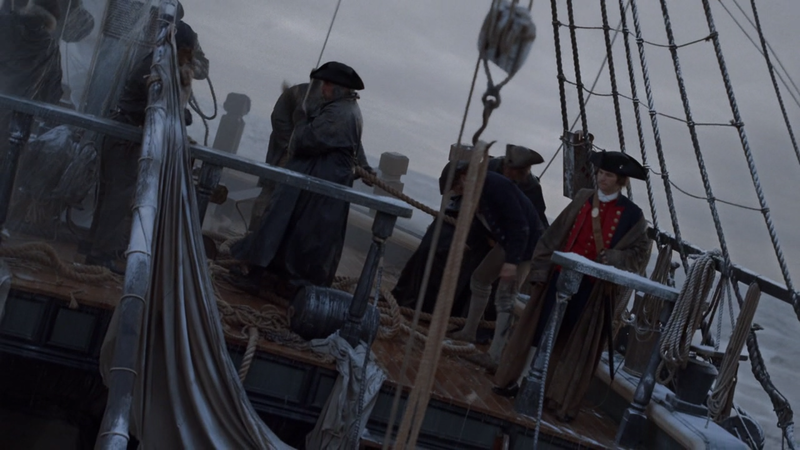 The first voyage depicted in the show is in 1736. Practically every depiction of sailors from my period of interest fall into two common traps, either conforming to an image created by writers/artists in the late nineteenth century or just directly copying common conceptions of maritime attire from the later eighteenth century/early nineteenth century. In the case of "Longitude," there is some improvement. For instance, the crew is not outfitted in mostly blue jackets or coats - something that didn't happen in my period of interest. I was particularly impressed with how the officers didn't all wear blue for a change. I was also quite satisfied to see many sailors wearing breeches rather than all of them in open-kneed wide breeches (most people today refer to them as "slop breeches") and trousers. Also, plenty of sailors wore their neck cloths at the proper position, close to the neck rather than open, loose, and away from the neck. There appeared to be waistcoats and jackets among the common sailors of appropriate skirt length and cut for the period - a refreshing change (though said crew appeared to go about with shirts only a remarkable amount of the time, not to mention lacking shoes). 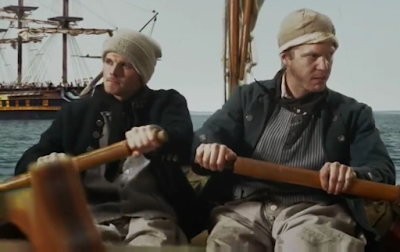 There are other voyages depicted in the show that fall into your period of interest (though not the American Revolution), I would recommend viewing "Longitude" for the maritime attire, if you haven't already. "Longitude" being more accurate doesn't surprise me that much since the producers of this show produced other historical maritime content that also made a lot of effort by Hollywood standards of accuracy (the company being ITV, many of the companies/channels that were or would become part of ITV made this show and many others with maritime settings). I thoroughly enjoyed "Longitude!" 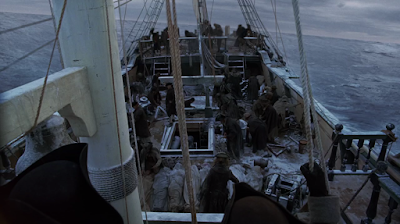 A damnably entertaining miniseries, even if the third act of the last episode dragged a bit. Have you, by chance, seen the travelling exhibit "Ships, Clocks, & Stars?" A wonderful summation of John Harrison's accomplishments, and the effect the chronometer has had on the world.